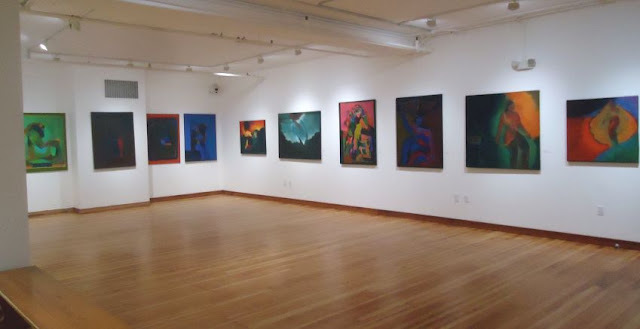 Just a few days remain to see the two exhibits, now in San Francisco, of art by Creation Migration curator Betsie Miller-Kusz, Before moving to the Jemez Valley, Betsie's longest sojourn had been in the bay area where she honed her painting skills and shared her curatorial and installation talents for many years. Two exhibits that honor her work have been on display there for the past six weeks. Preparation for them has been long and meaningful. 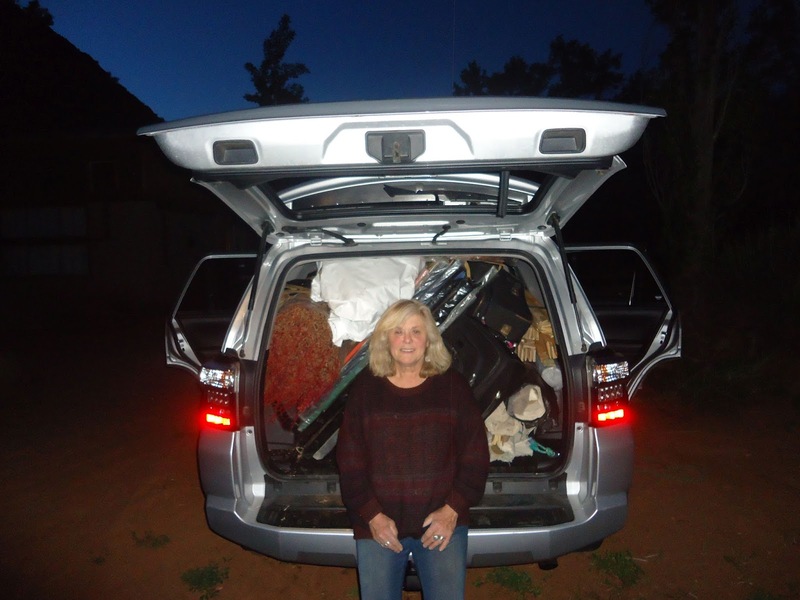 In order to transport all the work for two exhibits from Jemez Valley to the Bay area, Betsie traveled by car with her son and her work on a monumental journey. Take a look!! By taking her paintings off the stretcher bars, she was able to fit everything in her car. 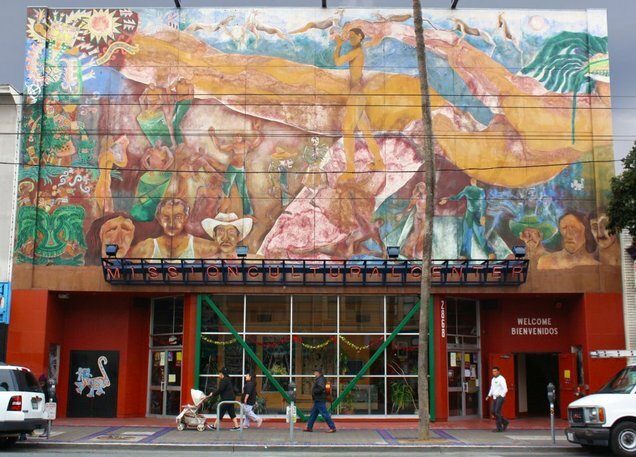 Over 30 years ago, Betsie worked with Latino artists Carlos Loarca and Manuel Villamor to paint the murals on the outside walls of the Mission Cultural Center for Latino Arts in San Francisco's Mission district. Now, with the murals badly in need of repair, the cultural center has launched a campaign to raise funds to have Carlos and Betsie do this much needed work. In support of this campaign, a selection of retrospective works by these two artists has graced the walls of the cultural center's gallery since May 20. The following November article from the Jemez Daily Post tells more about Betsie's involvement in the Puente Project. 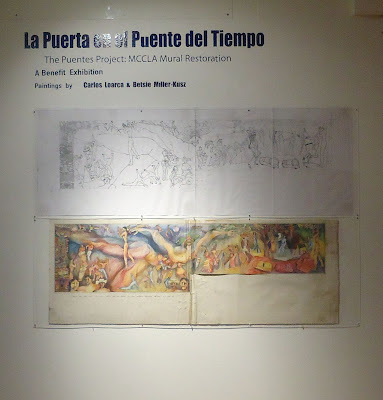 http://www.jemezdailypost.com/content/betsie-miller-kusz-and-puentes-project-san-francisco. The exhibit it called La Puerta en el Puente del Tiempo. 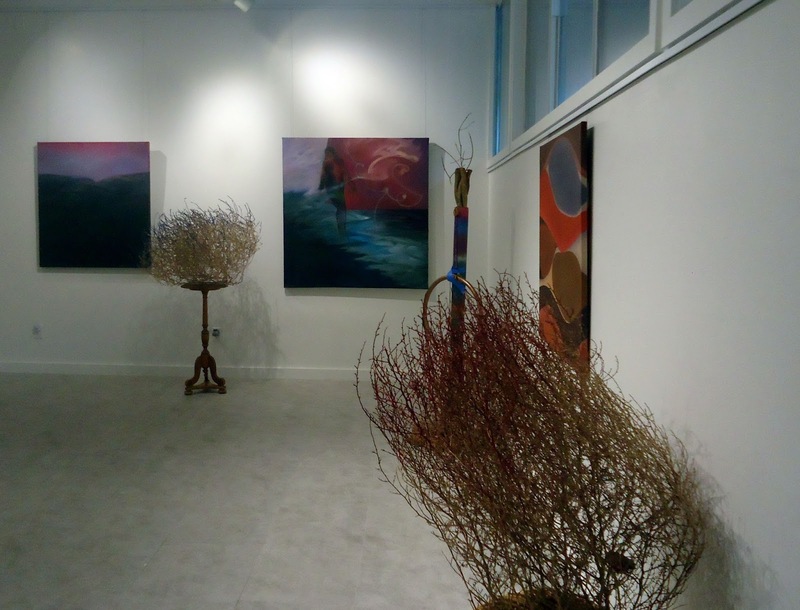 Below are some photos from the exhibition. 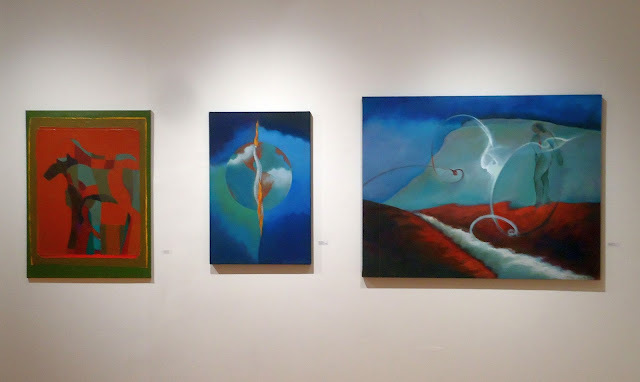 Running at the same time is a solo retrospective exhibit of Betsie's work at Think Round Fine Arts at 2040 Bush Street in San Francisco. 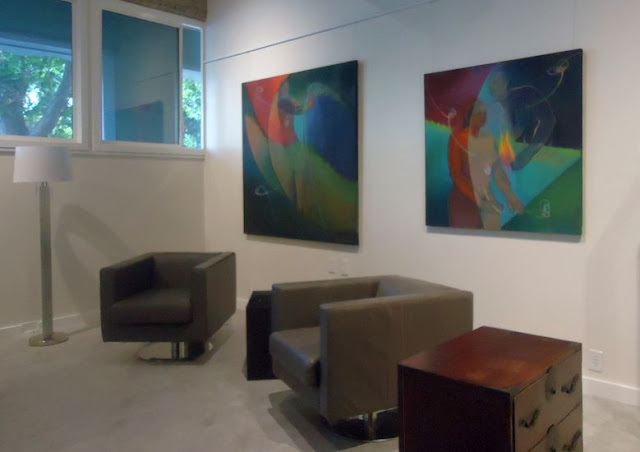 Here you can view artwork on spacious walls in a relaxed home-like atmosphere where you can sit back and take in the nuances of the paintings. 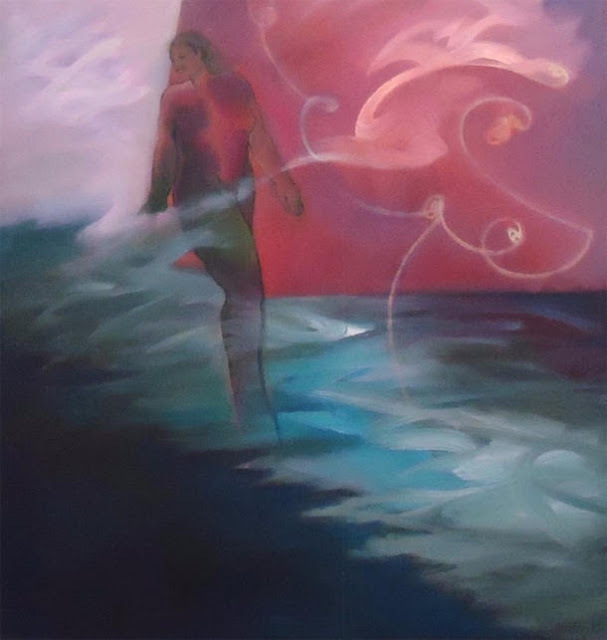 The exhibit, titled High Tides and Far Paseos is filled with luminous works of Betsie's Guardian figure crossing between worlds, sometimes by water, sometimes by air, sometimes by fire. Below is a close-up of the exhibits's cover image. The exhibit closes end of day June 27.